There are 456 theyyakkolams. Among this 112 are very important and famous. There are Theyya “Thotam” and “Vellatam” for almost all the theyyams before they perform. According to the characterestic features there are four types of theyyams. The word theyyam derives from the word “Deivam”, the Sanskrit word for ‘God’. Some believes that theyyam is a rare survival of some pre-Aryan and non-Brahminical Dravidian religious system that was later absorbed in to Hinduism’s capacious embrace. Others argument is that the theyyam were tolerated as an acceptable safety valve to allow complaints against the misddeds of the feudal to be expressed in a ritualized and non-violent manner. Today it is social ritual of every one in the area where social norms of the people are inverted and for a short period the position and power are miraculously transferred to the insignificant and deprived. Theyyam represents the common man’s spiritual and metaphysical beliefs as it encompasses the opportunity where the performer identifies with the God or the spirit of the ancestors or bygone heroes and guides the society even in matters of contemporary interest. Theyyam is also a reflection of the communal harmony as in some theyyam, few Muslim characters are included while performing. Theyyam is considered very important and communal event in various part of Kannur and Kasaragod district in Kerala. Usually Hindu dancer performs the Muslim theyyam with special costumes, adorns cap and artificial beard and some do the rituals like washing his hands and feet and recite some verses from the holy book, and performs Niskara rituals sitting on a green carpet as per Muslim tradition. Later he became one of the character with the main cult for the entire event. Some of the Moppila or Muslim characters like Ali Chamundi, Mokri Poker, Kallandha Mokri and Bappooran theyyam are very popular. Some Anthropologists categorized theyyam in to certain different type like Animal theyyam, Ghost or Spiritl theyyam, Hero theyyam, Ancestor theyyam, Incarnational theyyam, Joker theyyam, Thulu theyyam, Ramayana theyyam, Thacholi theyyam, Lady theyyam and Folk theyyam etc. There are theyyam which perform in the big temple where the main function is the Utsavam and idol dance of the Temple priest is the main event. In such temple theyyam perform during the same occasion but in different days. 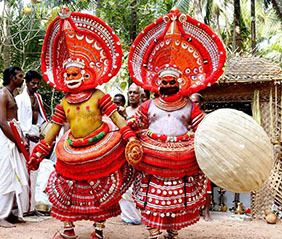 Usually theyyam performs outside the temple premise. Again theyyam can be categorized on the basis of their performances. Some will jump or lay down on the fire ember, some dance with fire fixed on their waist and in their head dress in semi circular shape, some shows marital arts like Kalari Payatu, some will climb on the tree, some will do the fishing, and hunting the wild animals. Few have an elongated head dress up to the length of twenty meter and some will perform before the sun rise, and few in mid night, in the early morning, during the day time, few will kill the hen and drink the blood, some will take the coconut extract with alcoholic effect, some will visit the home, and nearby temples. The striking peculiarity of the theyyam is that certain theyyam perform in the houses as the family have the tradition of conducting such ritual through out the year. During the occasion the family members assemble together in their Tharavadu House and conduct the function. On an appointed day the theyyam performer whose hereditary right is to become the theyyam joins the family congregation and the theyyam is rekindled. Here the date of theyyam will be decided by the family member on an auspicious day. The main aim of permorming theyyam is the overall welfare and development of the people. Some believe it will increase the wealth, to get a good job, to eradicate certain deseases, for the wealth of domestic animals, to get relief from sins, etc.